Want to get rid of those pesky hairs? Try these tweezers with over 6,000 reviews. There's something magical about finding the perfect tweezers. The kind that effortlessly yank out unwanted hair easily without making me flinch. As I get older, good tweezers have become a necessity. I'm inching towards my 40s and random grays must be regularly extracted from my hairline. Plus, other strands continue popping up in unexpected places (chin, anyone?). Tweezers are the ideal purse-friendly solution for many hair grooming emergencies. And, plucking prevents my eyebrows from looking like overgrown tumbleweeds when I miss my wax appointment. For a long time, I didn't think the type of tweezers I used made any difference. Then, I tried my mom's rounded tip pair. The blunt tip refused to clamp down on any fine hairs — and when I finally did catch a hair, it felt like I was pulling it out in slow motion. When I finally stopped, my eyes had already started to water from the pain. Needless to say, I returned them promptly to my mom's bathroom cabinet and never used them again. Next, I went looking online for slanted tweezers with lots of positive reviews. I figured a slanted tip would do a better job grabbing hair. 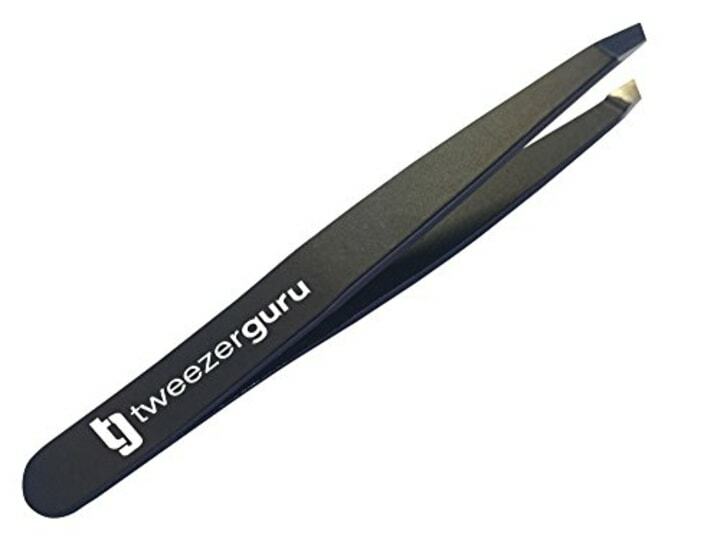 I came across the TweezerGuru Professional Stainless Steel Slant Tip Tweezer on Amazon. Not all the 6,000 users gave the tweezer five stars (some swore by more expensive tweezers used by celebrity eyebrow stylists). But, at $10, it was worth a try. Also available for $21 at Sears. As soon as these tweezers arrived, I ran to the bathroom mirror for a pull test. I looked for the smallest, thinnest hair on my brow and gave it a yank. To my surprise, it came out with ease. I barely flinched. I was impressed by how these cheap hair pliers could easily grab, pull and take out the enemy! But finding a good tweezer is just half the battle. I also needed to learn how to tweeze properly. Yes, I was a victim of the '90s thin eyebrow craze. And, while I want my eyebrows to look neat, I sure didn't want to make the mistake of over-plucking (again). I turned to Benefit Cosmetics Global Brow Expert Jared Bailey for some tweezing tips. He said I didn't actually tweeze too often back in my college days, I more likely tweezed the hair in the wrong direction, causing hairs to vanish permanently. He said each hair is connected to a tiny blood vessel. So, if you rupture the vessel during a pluck session, the hair may never grow back. In some cases, hair gone for good may be the desired outcome. But for those who want the option for hair to return, the trick is in the pull. "You must pull the skin tight with one finger and then tweeze the hair in the direction it grows. Typically that direction is upward or toward the temple versus straight out away from the face. It’s really important to work with Mother Nature on this one," said Bailey. Ditch the magnifying mirror. You may end up too close to a field of tiny hairs and miss the actual shape and what it’s doing for your entire face. Use natural lighting. Not everyone’s bathroom is built like a terrarium, so if possible take a mirror you can prop up and tweeze near a window with even lighting on your face. Use a micro liner. Use a liner like the Benefit Precisely My Brow Pencil to fill in your brow into the desired shape before you remove any hairs. This way, you can see which ones need to go and which ones need to stay. Don't tweeze after the shower. He says the idea that hairs become easier to remove after a shower is a myth — follicles don't really function like pores. Take care of tweezers. Dab some alcohol on cotton pads and wipe down tweezers after a few uses. They'll be good to go! Finally, Bailey said, even if you do have thin brows (like me) using pencils, brow wax, and other makeup can help them look fuller.